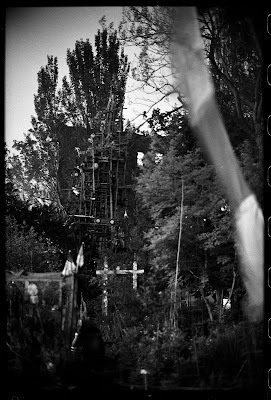 Eddie's tower is soon to be torn down and the " 6 and B garden will never be the same . 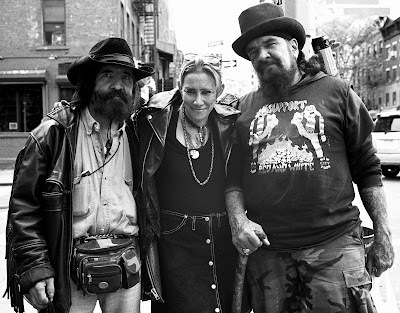 This weekend on Sunday , May 11 , from 7pm to 9pm there will be an informal celebration of Eddie Boros' "Tower of Toys" in the "6 and B" garden at the intersection of avenue B and 6th street . 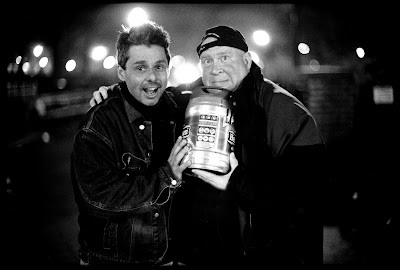 Biker Bill Says : "Go to the Trough Too Often for Beer and Soon it's Out the Door and Without a Job You'll Be"
During the Giuliani administration we were introduced locally to the practical application of the "broken windows theory " of James Q. Wilson by Jack Maple ,William Bratton and others at NYPD . Wilson with George Kelling had co-authored an influential article in the Atlantic Monthly in 1982 that presented the basic components of the theory to the general public somewhat earlier . 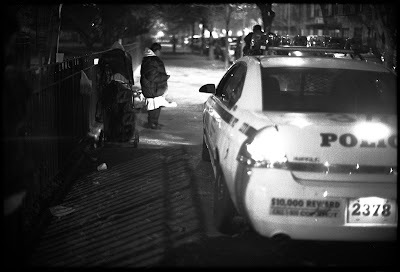 The theory claimed that proactive crime prevention included , among other things , cleaning -up neighborhoods physically ; doing things like replacing broken windows helped reduce crime by demonstrating that someone cared about the continuing healthy stability of the neighborhood . NYPD and the Giuliani administration made the theory one of the foundation stones of their crime prevention program . 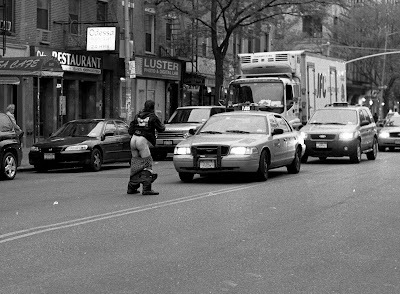 A program which in the end did reduce crime in the toughest nieghborhoods of this city such as the East Village out on the alphabet streets . 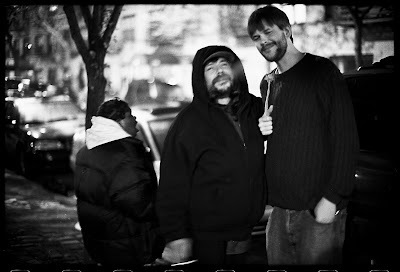 On March 31 we posted a story about gun-shots being fired at 290 east 4th street . We posted a picture of the front of the building including bullet-holes in 2 panes of the double-thick bullet resistant glass of the entrance to the building . 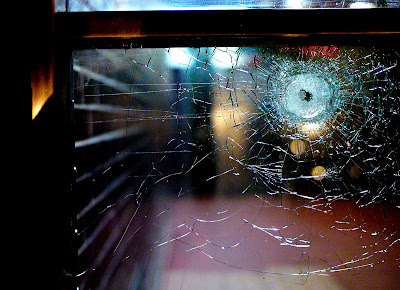 It is now more than a month later and as can be seen above the broken windows , broken by bullets , still remain in place . Why ? How does a parent explain and endure this lingering , coruscating and heinous trace of past gun-play at the entrance to their building when walking with their child or children into the building . 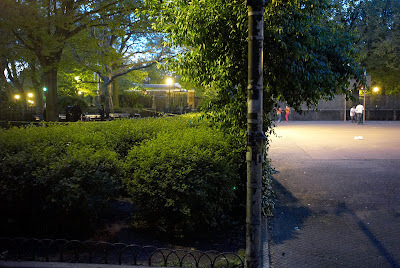 A simple chain-link fence and some shrubbery separates the basketball courts from a small area enclosed by bushes , rows of seats and trees .This area sits quite isolated from most of Tompkins Square Park . 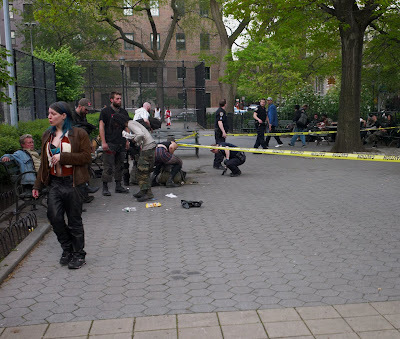 Sunday afternoon in this little enclave a man's face was slashed with what was described by witnesses as a box cutter . This small piece of TSP where the slashing occurred has since late last summer been claimed and occupied by groups of people that for several years previously had occupied the rows of seating known as "Crusty Row" . "Crusty Row " was located in a more central portion of TSP next to the current dog run. 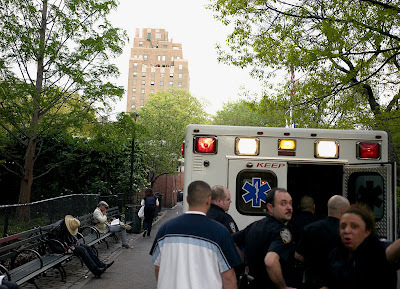 Early Sunday evening at around 6:15 a black male in his 20s , after an argument , slashed a white male's face in Tompkins Square Park . The victim was also in his 20s . The victim appeared to be not too seriously injured. He was removed to a hospital for treatment . According to witnesses a remark was made concerning a missed shot on the basketball court by someone in the area adjacent to the basketball court . This remark angered a young man who was on the basketball court and who was to later to slash the victim . The young man left the basketball court and confronted the group of young people sitting in the seating area adjacent to the court . There was a brief altercation , then the young man pulled out his box-cutter and slashed away , slashing his victim's face . The angry slasher then fled through the park to the south . He tried for 20 minutes or so to leave the park by climbing over the padlocked gate . The inexplicably padlocked gate thoroughly befuddled him ; leaving him alternatively lost in long periods of contemplation of his challenge and periods spent resting , overcome by failure in each and every attempt to climb over the gate to freedom . How could it be locked in the middle of the afternoon and how was he to leave the park this afternoon . Thoroughly soused as always , every attempt to climb over the gate failed , usually at the first lifting of a leg then tottering ; just not enough strength and co-ordination to get up and over the hurdle . Never mind that none of this worried effort was necessary ; the other park gates were of course open . 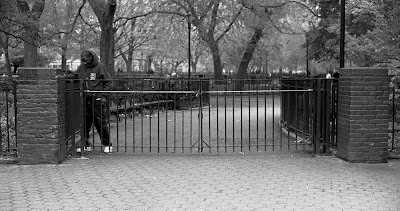 Friday afternoon the main gate to Tompkins Square Park at the corner of 7th St. and avenue A was inexplicably locked . 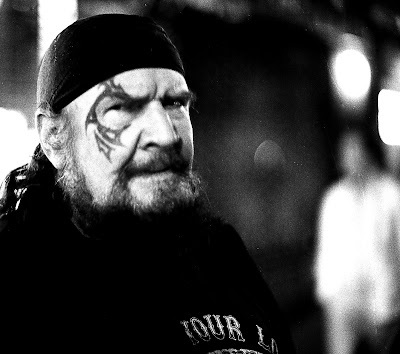 Though mostly sober , most passers-by were as puzzled as "Cochise" by the padlocked gate . We were told by some that the gate had been closed by NYPD because a film crew was shooting a movie version of "Sesame Street" in the park . 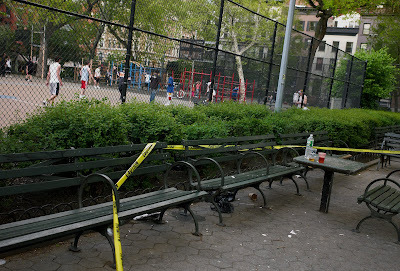 Some had further elaborated that an exhibitionist had been exposing himself in the park and that the gate was closed to keep young children out of the park . Specifically the food tent for the movie crew had been flashed in an effort to extort some free food . 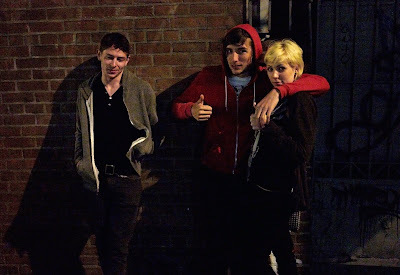 Later , at least part of the mystery revealed itself when we saw L.E.S. 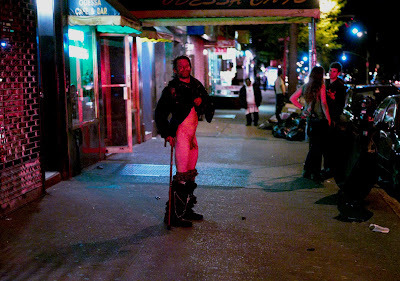 Jewels in his spring debut "mooning" and "flashing" traffic on avenue A .
Saturday Night at Midnight NYPD Closes Tompkins Square Park : Sunday Morning The Party at the Park's Chess-Tables Moves On , Uninterrupted. 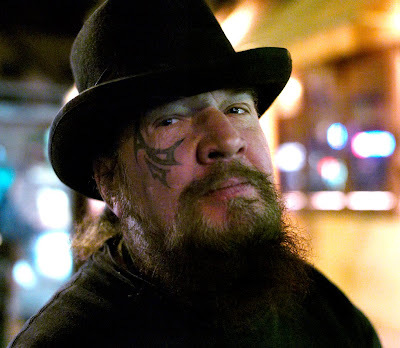 Biker Bill Says : "There Are Warriors and There Are Worriers .... and Worriers Never Become Warriors Worrying ."